The transition from nappies to the toilet can be a daunting experience for both the parents and the child. The key to successfully getting your child comfortable with sitting on the toilet is safety. The Baby Bjorn Potty Training Seat is that comfort factor. One of the most safest and ergonomic training seat your child will ever sit in. Lets take a look at why this chair excels safety and is a much loved potty training seat among thousands of parents. So you may have already established that it’s not a potty and its a seat you put on the toilet. This method of toilet training can be used as a progression from the potty, or can be the first initial step to toilet training your child. Many children don’t like the potty, like our eldest daughter. She wanted to sit in a big girls potty. Not awkwardly on the potty on the floor. Wasn’t comfortable at all. Children get such satisfaction and pull a great deal of confidence when they achieve what we adults do on a daily basis. Such as using the toilet. Wanting to use a big girls or big boys toilet is a natural progression and a great way to encourage your children onto the toilet. 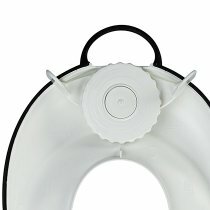 This Baby Bjorn toilet seat satisfies children’s fear of slipping into the bowl. The unique opening to the seat is small enough that children wont fall through. Yet wide enough for Mom and Dad to help teach their children how to wipe. No sharp edges! The contoured soft edges making getting on and off this seat fairly easy for kids. With no sharp edges and a curved lip making this seat very safe. The seat is made out of a hard plastic. This is very good because it doesn’t crack and collect germs like the padded variety. There are two things that I and many other parents simply LOVE about this seat. It’s safety. In particular two elements make this chair perfectly safe for all children. Ages 2 to 6 is recommended tho. First safety aspect that helps your child feel confident sitting on this seat is the rubber trimming. The colored red or black rubber trim sits firmly on the toilet seat. Gripping onto the plastic preventing any sliding action. The second safety feature is the adjustable dial which is located underneath the trainer seat. But you can adjust it from the top at the back. This adjuster moves the wings underneath the seat to attach to the toilet seats bowl. Giving an even tighter and safer feeling. Also stops any pinching that can occur on your child’s legs or bottoms because the trainer is firmly in place and won’t trap any skin in between. The things parents rave on about the most are how easy it is to clean and how the trainer seat fits pretty much any toilet on earth (Haven’t tried them all). 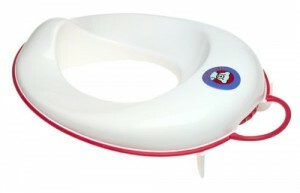 What we really love about using a seat over the potty is how easy this seat is to clean. It’s a matter of picking up the seat from the handle located at the back and wash it under hot water. Also there’s a built in splash guard to prevent any mess outside the toilet. Handy! This seat fits ALL toilets! Even oval shaped toilet bowls. That adjustable lever we talked about before makes this seat fit on any toilet. So not only does it bring safety to the table, it also brings convenience. Because it fits any toilet, it means you know have a portable potty. Take the seat with you whenever you go away or to the park etc. With confidence that your child can go to the toilet safely. The best source to get more reviews for this seat is at Amazon. With over 600 parents reviews that give this product an unbelievable 4.7 star rating out of 5. Along with the hundreds of positive reviews you can also find the best prices their also. Check them out below.